A 12-year-old girl disappeared on Saturday while riding her bike, and several agencies have been working night and day to find her. Autumn Pasquale, of Clayton, N.J., was last seen leaving her home on a white Odyssey BMX bike at around 12:30 p.m., the South Jersey Times reports. 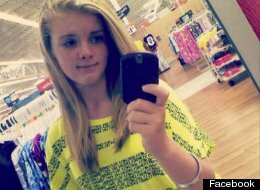 Her parents, upon realizing she didn’t make it to a friend’s house, reported her missing at about 9:30 p.m.
She’s described by posters on a Facebook page set up to help find her as blonde, 5-foot-2 and weighing 120 pounds. She was last seen wearing navy blue shorts underneath navy blue sweatpants, a yellow T-shirt with “Clayton Soccer” on front, and bright blue high-top sneakers. If you have any information on her whereabouts, please call the Clayton Police Department at 856-881-2300.